I made a video using the Greg Scruton method of Flipping the Classroom. My topic was how to use the Calendar app as an Agenda. I wrote a script. here it is: SCRIPT- Calendar as agenda. It was too long, as I found out later. I recorded my screen with Quicktime Player. I edited the parts where I tell people the table of contents as well as the end part, which cut my movie down to 5 min 30. Still a bit long for an explainer video, so I definitely have some work to do, but I think it is better than my first attempt! I uploaded it to youtube so I could share it with you! Here is the video – please feel free to use it with your advisory! Let me know what you think and thanks Greg! rAPPido Review: Inklewriter – Don’t just choose your own adventure; Write it! Educational Gaming has been on my mind lately. But my brain had been thinking of it mainly in the context of an innovative, interactive way of teaching digital citizenship skills. But then I cam across the BBC’s heart-wrenchingly effective Syria Journey: Choose Your Own Escape Route, where you must make the devastating choices Syrians must face due to the civil war in their country. I know, I know. I have already sent the link to the staff at our school twice now. But it had so much impact on me that I’ve decided to hit you over the head with it. 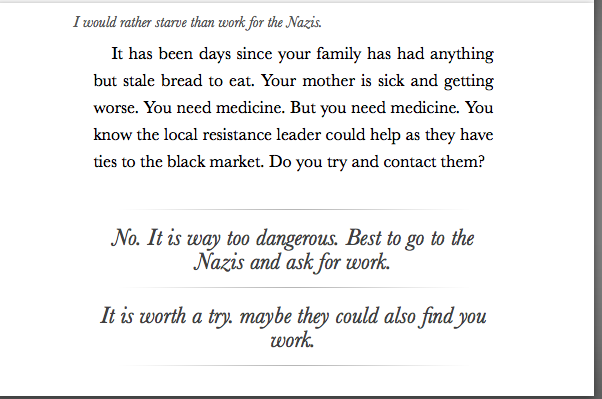 But it isn’t just the fact that the game gave me a terrifying glimpse into what it must be like to be a Syrian refugee. It was because for the first time since I had been thinking of gasification, I realized how simple it could be to have a maximum impact. Then I thought about how much I loved the Choose your own adventure books when I was a kid. And then I thought about the Introduction to WWII project I was revamping for the Grade 9 English class to compliment their reading of The Book Thief by Marcus Zusak. Gaming. Education. Story-telling. There must be an easy digital storytelling tool I could use, right? I was super excited to try Inklewriter. It is super easy to use – you don’t even need to sign in if you don’t want, though you will need to provide your email and a password in order to save your story. 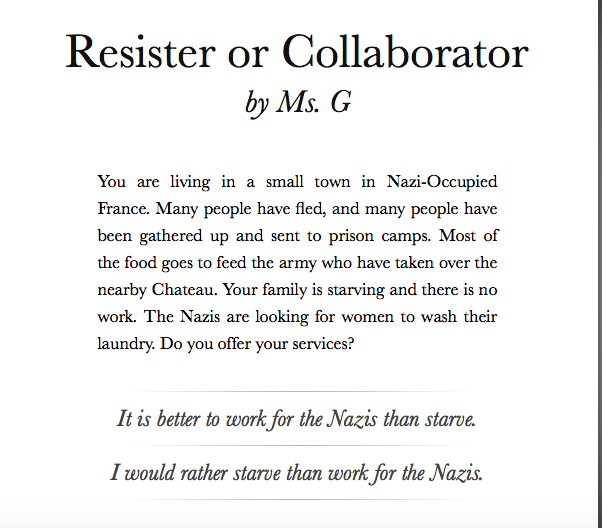 I am going to use it for the group who will be researching resistance and collaboration in Nazi-Occupied Europe. 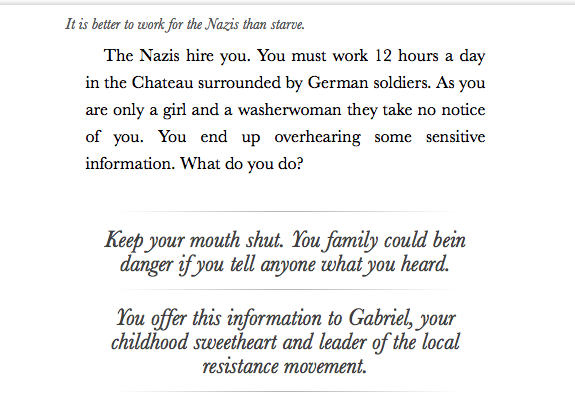 We are going to ask the students to write a choose your own adventure story from the point of view of a young girl who is living in a small town in a Nazi occupied town. Her family is out of work, out of money and out of food. What are the choices available for her? Well, you see where it could lead. The above literally took me about 20 minutes to make.It struck me as I was writing, that it isn’t just a good tool to highlight the greyness of hard, ethical decisions, but it is also a great, fun technical tool to teach students about plot and voice. As a writer, it reminded me that stories are really a chain of decisions your characters make. It made me look at my own creative process in a new light and I am eager to use this kind of tool for my next project! How could you use it in your class?